From small acorns giant oaks grow. 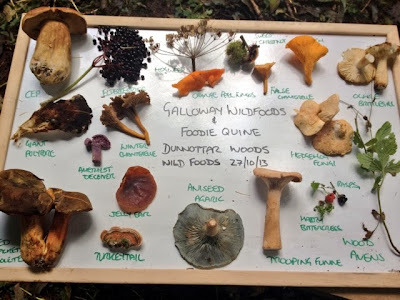 Following on from a visit to Crail Food Festival when we went on a Coastal Forage with Mark Williams of Galloway Wild Foods an idea began to germinate. I made contact with Mark and asked if he might be interested in facilitating a foraging event in my neck of the woods. I reckoned I should be able to get enough folk on board to cover costs and have an informal wee get together to satisfy my own interests. It was then that the acorn began to grow arms and legs. Taking a giant leap into the unknown with Mark's help and advice from Kathers Kitchen who had hosted a similar event, we agreed a date and put the event on sale with the proviso that we'd pull the plug if there was no interest. 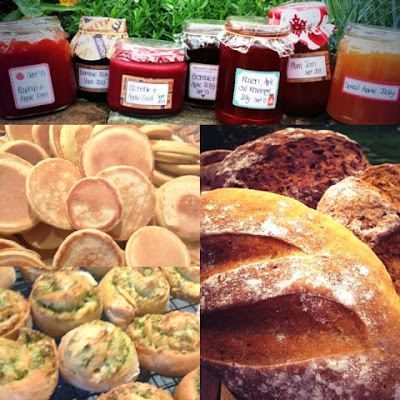 My first ever "Foodie Quine Presents..." event. Within half an hour of tweeting that sales were live I'd sold my first 2 places and within a week 19 out of 20 had been snapped up. 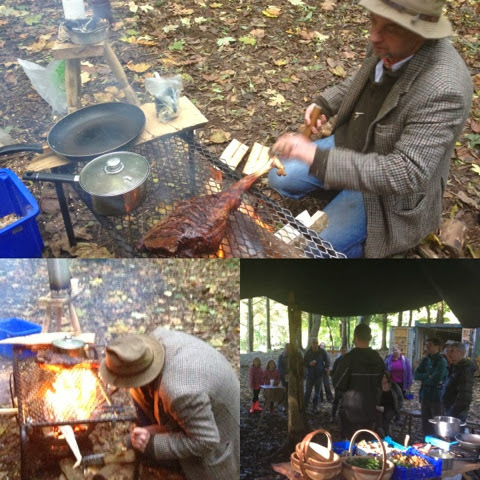 Long story short we ended up hosting a two day Wild Food and Foraging Event for 40 people. We were so lucky with the weather over the weekend as the forecast didn't look all that favourable and the Friday was a total washout. Despite somewhat squishy underfoot conditions the skies remained clear. 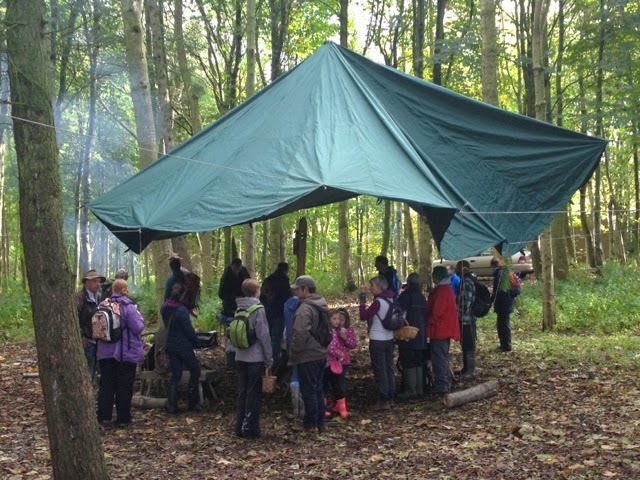 We had fantastic support from the local Bodging group based in Dunnottar Woods who had heard what we were up to and offered to get involved. 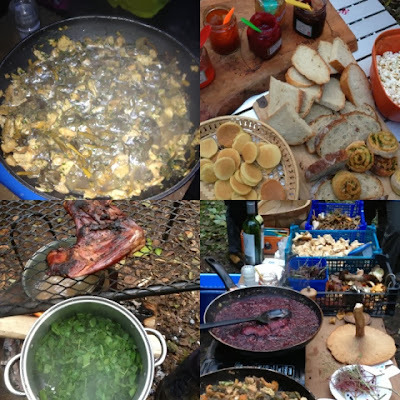 They gave us access to their cabin, tarp, fire, shared their green woodworking skills and knowledge and even provided us with Venison. Huge thanks to all round good guys Alan and Dave. 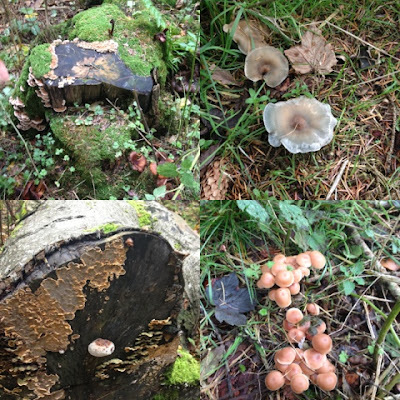 Photo heavy post now coming up as I'm not going to even begin to try to identify and name all the edible and non edible plants, berries and fungi that we found on our travels. That's far outwith my level of knowledge and I need to sell places on future events. Rather I'll share what we got up to and give you a flavour of what we did, saw and ate over the two days. Even although it was late in the season and the Autumn fungi harvest was in its twilight we were nevertheless lucky enough to encounter a huge selection of interesting species. Practically all of which I would have walked straight past on any other day. 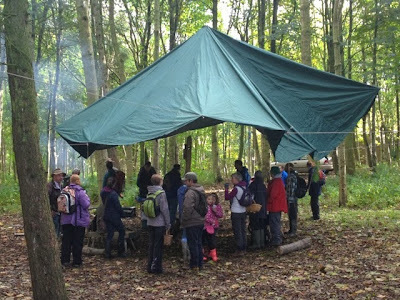 Following our walk it was time to head back to base camp for the wild food tasters. We had been out and about for almost 3 hours and covered a surprisingly small area. 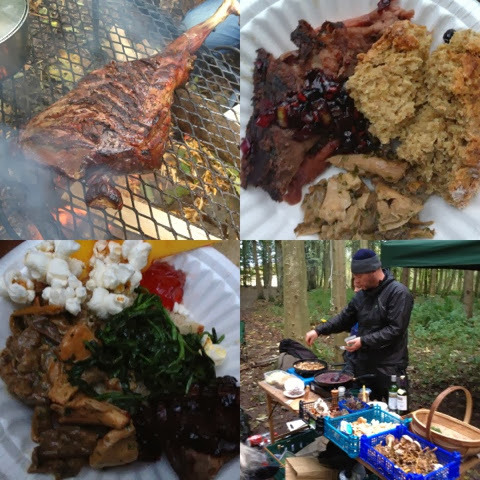 Mark and myself cooked up tasters from what we had gathered combined with some additional foraged goodies brought along by Mark. 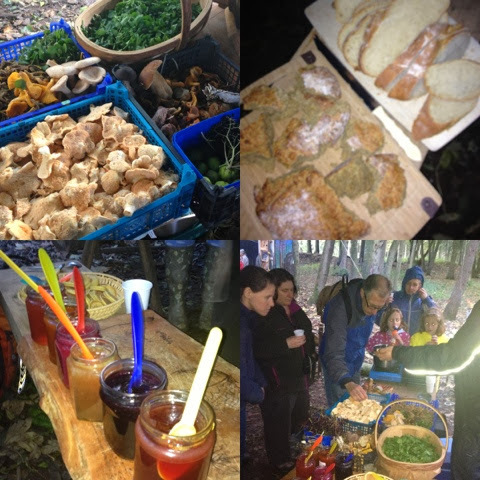 Over the course of the two evenings we enjoyed Venison (provided by the Bodgers), Wild Mushroom Fricassee, Seaweed Popcorn, Elderberry, Rowan & Apple Sauce and Wilted Greens moped up with Lisa's Bread and washed down with Elderflower Champagne. Huge thanks to Mark for his invaluable knowledge and enthusiasm that he so readily shared over the course of the weekend. 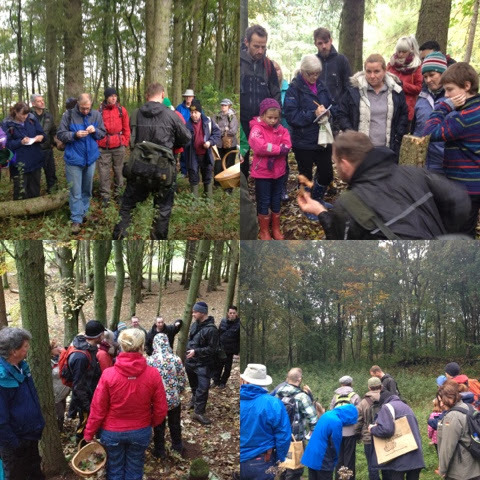 To everyone who came along. An amazing group of interesting folk. 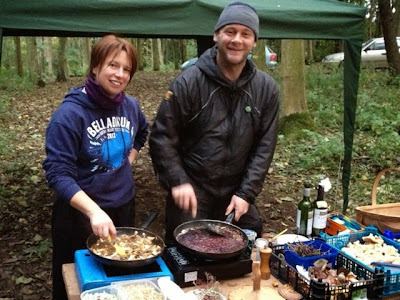 Especially great to have some chefs on board to add to the expertise. Thanks for all the feedback, both positive and constructively negative. All will be taken on board. It was a steep learning curve for me and next time round hopefully things will run easier and we will implement changes from what we have learned along the way. Did I say next time round? Yes there definitely will be more to come. We are currently in discussion for three events in 2014. 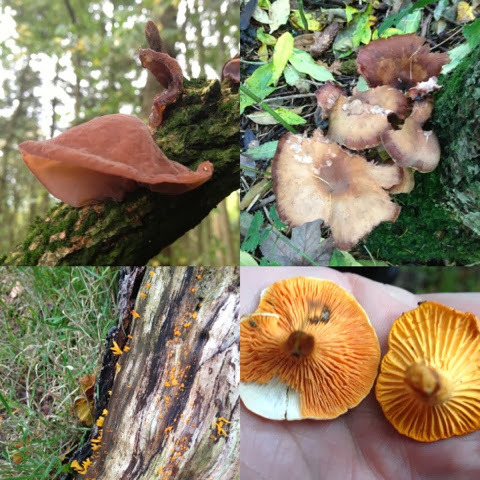 Autumn - Full on Fungi. Keep me on the mailing list please, Claire. I'm sorry but I can't find the feedback survey. I have a brilliant day. I thought Mark was very generous with his knowledge and fascinating to listen to. 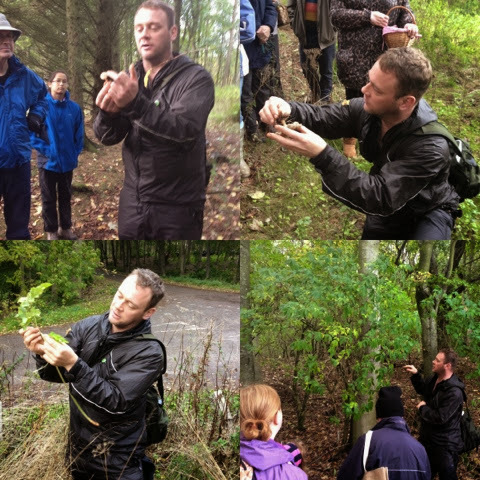 I was seriously impressed with how much he found to show us and talk about in such a small area. I thought we were remarkably well fed with the Parkin, pinwheels, bannocks, selection of brilliant preserves, venison, mushroom fricassee, elder sauce, breads, champagne! I honestly can't think of any way you could have improved it.